Birefringent Filter is made by crystal quartz. 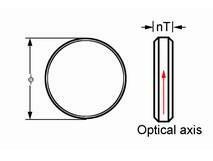 It's used in the laser cavity for wavelength selection. We can provide different thickenss birefringent filter for our customer's laser applications.